TUCSON, Ariz. — One day after hearing last week about the border experiences of three Border Patrol agents, the Presbyterian Mission Agency delegation learning about issues along the U.S.-Mexican border and in Guatemala heard a different take from the Moderator of the 1992 General Assembly of the Presbyterian Church (U.S.A.). The Rev. 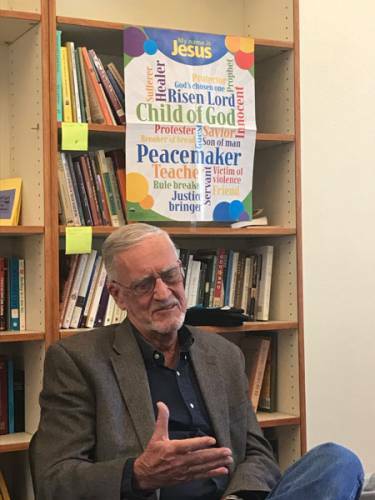 John Fife, a longtime human rights activist and pastor emeritus at Tucson’s Southside Presbyterian Church, where he helped found the Sanctuary Movement during the 1980s, said the movement was begun to help stop deportations to Guatemala and El Salvador, embroiled in internal armed conflicts. But “the real traction happened” when cities and law enforcement agencies — more than 500, as well as seven states — declared public sanctuaries “based on best law enforcement practices,” Fife said. “You can’t have a major part of your community so afraid of law enforcement they won’t report crimes.” Law enforcement “really didn’t have any other option if they were going to use best police practices,” Fife said. Fife said nearly 9,000 sets of human remains have been found in the Arizona desert, perhaps only a third of the people who have died trying to enter the United States. While groups including No More Deaths have established medical clinics, “we have documented the destruction of humanitarian aid in the desert,” Fife said, and “we have documented Border Patrol violations with absolute impunity.” Groups have partnered with the American Civil Liberties Union “to get dramatic changes ordered by the court,” he said. “We spend a lot of time with these folks, and we know their stories,” he said of migrants. “We know the origins of their high-risk journeys, and what does Trump say? These are bad people and we don’t have any choice but to prosecute. BS!” he exclaimed, using the more colorful term for bovine fertilizer. Fife said he sees at least one immediate need.